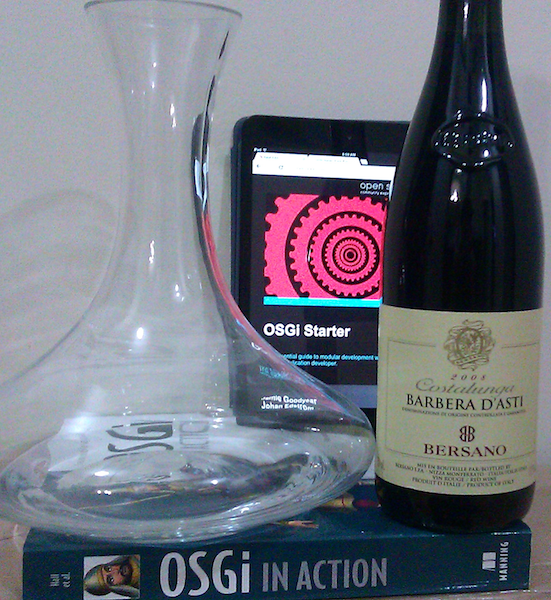 Now that I'm back home from EclipseCon / OSGi DevCon Boston 2013 I wanted to write a little wrap up post on the whole experience. 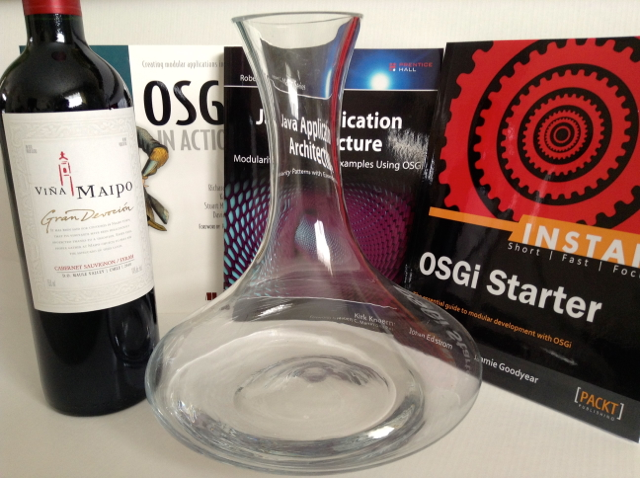 For starters I'd like to thank the organizing committee at the Eclipse Foundation and the OSGi Alliance for all of their hard work to put together the event. 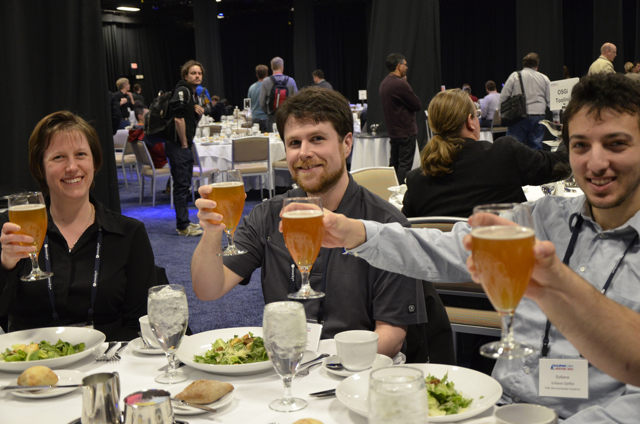 Starting from the tutorial day through three days crammed packed with talks the whole experience was wonderful. 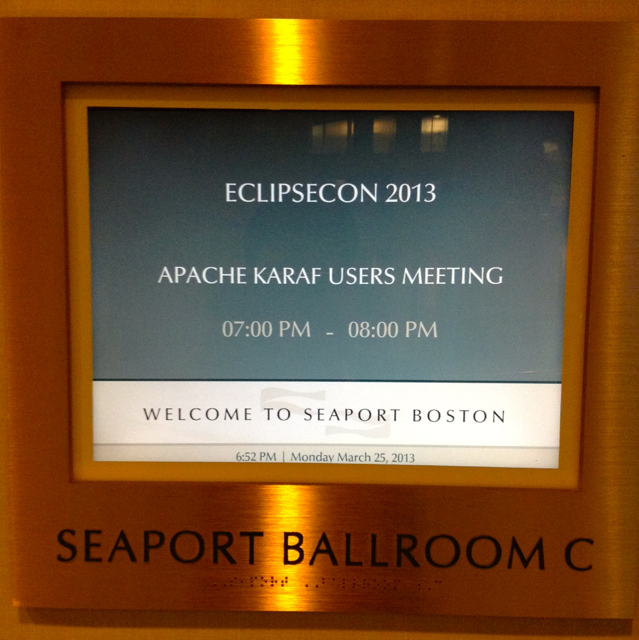 On Monday evening the event organizers made a meeting room available for Apache Karaf users to meet up and share use case stories, concerns, and talk about projects we've deployed on Karaf. 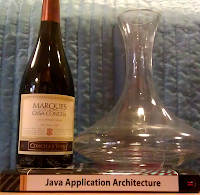 A couple recurring themes popped up, including: Raspberry Pi support, better P2 integration, and more tutorials on using Eclipse projects on Karaf. 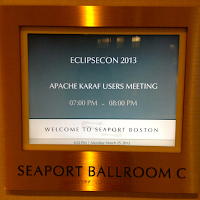 To the later I've uploaded a few Eclipse-Apache Karaf project talks to Karaf's articles web page: From Eclipse Tycho to Apache Karaf: the easy way!, and RAP Application in Karaf with Felix and PAX-WEB The required RAP Apache Karaf archive described in the article can be found here. As to Raspberry Pi support there has been some discussion on the mailing lists from users booting Karaf, but there are some edge cases such as service wrappers that need to be ported to the platform. 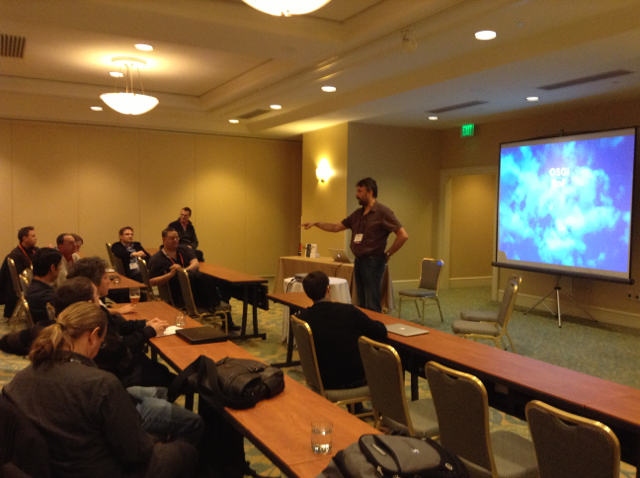 On Thursday morning I had the pleasure of presenting my talk on my experiences from using Apache Karaf in the trenches. I've embedded a Prezi web copy of my talk below, however it lacks my verbal delivery of stories and context for the slides. The audiences' variety of excellent questions, active listening, and insightful comments really made the whole session feel far too short. After the talk I spent the better part of an hour answering follow up questions from attendees in the hallways outside the lecture rooms. Karaf-2250 duplicated bundle found in cluster:bundle-list when cluster:bundle-install a bundle version like 1.02.12-SNAPSHOT. Karaf-2217 The "Getting Started" link on the project page is broken. Note: Apache Karaf 3.0.0.RC1 Technology Preview is now available! Apache Karaf 3.0.0.RC1 Technology Preview Released! The Apache Karaf team is pleased to announce the availability of Apache Karaf 3.0.0.RC1 Technology Preview! The particular release of Apache Karaf is not intended to be used in production, it's sole purpose is to give our user base the opportunity to experiment with Karaf 3, and provide feedback to the community. 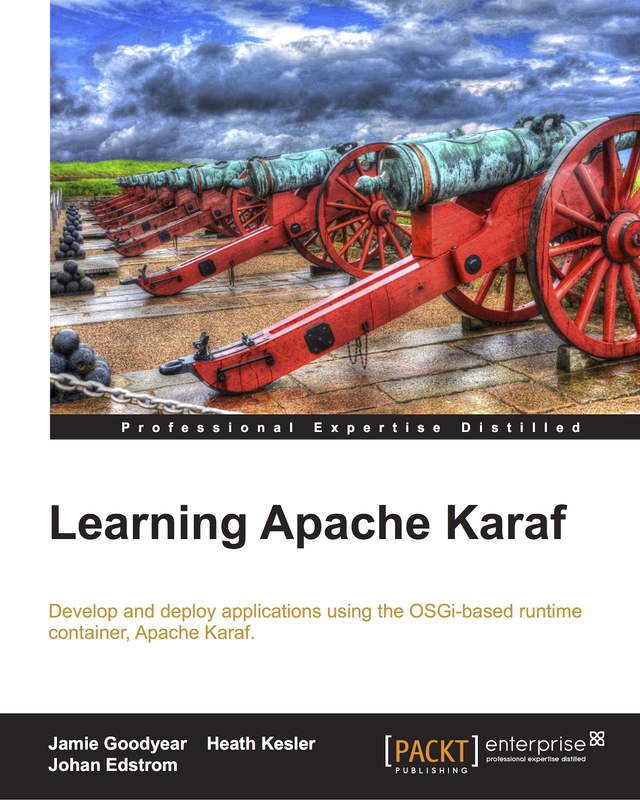 There will be a proper Apache Karaf 3.0.0 release once we've brought the branch to a level of stability that we can promote the code as production ready. I'd like to thank the entire community for their continued patience, interest, and support on our road to a full Karaf 3.0.0 release. All user feed back will be greatly appreciated, we can't wait to have Karaf 3 ready for prime time. In this Apache Karaf update report you'll find notes on development progress towards Apache Karaf 2.2.11, 2.3.2, and 3.0.0 as up coming releases. All of the information here is collected from following Karaf's issues mailing list, and cross referencing with the community's issue tracker. The summary form is presented here courtesy of Savoir Technologies to help make keeping up with the community's fast pace a little easier. 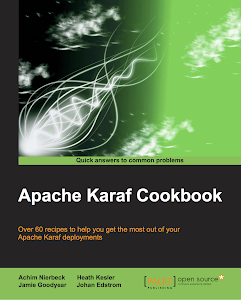 Note: Apache Karaf 2.3.1 is released! The Apache Karaf team is pleased to announce the availability of Apache Karaf 2.3.1. Apache Karaf 3.0.0 is next in line as a release candidate. Please note that Apache Karaf 2.2.11 should be the last patch update to that branch, with support continuing on Apache Karaf 2.3.x. A new branch will be created soon for Apache Karaf 2.4.x - this will contain any new features we want to include on the 2.x line (2.3.x will be just for bug fixes). Attending EclipseCon Boston 2013? 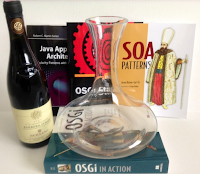 Are you using Apache Karaf for your OSGi runtime environment? Want to meet up with other users and discuss our experiences? 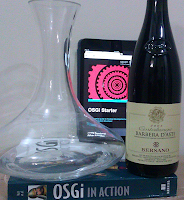 Join me for a general users meetup. Discuss and share how we're using Karaf. 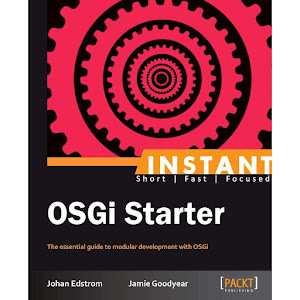 We'll also be drawing for a printed copy of "Instant OSGi Starter". This Birds of a Feather meeting will take place in Seaport Ballroom A (room C) on March 25 from 19:00 to 20:00. To see the list of other Birds of a Feather meetings at EclipseCon Boston 2013 please visit http://www.eclipsecon.org/2013/program/session-schedule/bofs.